Bangkok, 7 January 2015: The 2015 Mekong Tourism Forum is set to be hosted by the Ministry of Culture, Sports and Tourism of Viet Nam in Da Nang City at the beautiful central coast on 16-19 June, 2015. 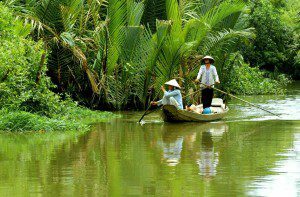 Under the theme, ‘Unlocking the Potential of the Mekong Region via Innovative Partnerships’, the tourism event for the Mekong region will showcase emerging tourist destinations and trends in the Greater Mekong Sub-region (GMS). The six member countries of the Greater Mekong Subregion have banded together to jointly promote sub-regional tourism product development, market the GMS as a single travel destination, and stage the annual Mekong Tourism Forum. The Forum is the event of the year for travel industry professionals dedicated to putting the GMS on the global travel map. Tourism leaders from the public and private sectors and regional development partners attend the Forum as the ideal place for travel industry stakeholders who are serious about developing the region’s cross-border potential. Business and government leaders will assess the latest tourism developments and investment opportunities along the regional road networks linking Cambodia, Laos, Myanmar, Thailand, Viet Nam and the China’s provinces of Yunnan and Guangxi. The forum is supported by the United Nations World Tourism Organization (UNWTO), the Pacific Asia Travel Association (PATA), and the Asian Development Bank (ADB). The Mekong Tourism Forum will feature top keynote speakers and interactive panel debates. In order to increase relevance, various sideline events will be staged, including the Mekong Tourism Investment Summit, and the E-Tourism Asia Boot Camp. For the fourth time, the E-Tourism Asia Boot Camp will focus on four key areas, including social media and mobile marketing to key target markets including Europe, North America, and Asia; how to work with bloggers and key digital influencers; understanding online distribution and working with online travel agencies; and marketing to affluent Chinese consumers via digital and social media. The Mekong Tourism Advisory Group (MeTAG) Meeting will meet to discuss the new Mekong Tourism Marketing Strategy & Action Plan 2015-2020 and how the public and private sector can partner and collaborate in promoting the GMS as a single tourism destination. “We are looking forward to hosting this influential networking gathering and invite the world to Viet Nam’s beautiful central coast,” said Dinh Ngoc Duc, Director General, International Cooperation Department, Viet Nam National Administration of Tourism. “We are in a pivotal time when innovative partnerships are essential to unlock the potential of the Mekong region and strengthen collaboration between the private and public sectors,” he said. The 2015 Mekong Tourism Forum is free to attend for qualified industry professionals, however we will encourage donations to a yet to be determined responsible tourism initiative in the Greater Mekong Sub-region (GMS). Please view the most current MTF 2015 Agenda athttps://goo.gl/HR7A8P. Availability will be on a first-come first-serve basis. No-Show – Show Kindness: We encourage last minute cancellantions and No-Shows to donate $500 to our MTF 2015 Charity Partner KOTO. For more information, please visit http://www.mekongtourism.org/trade-professional/mekong-tourism-forum/mtf-2015 andwww.mekongtourismforum.org. Established in early 2006, the Mekong Tourism Coordinating Office (MTCO) is a collaborative effort between the six countries of the Greater Mekong Subregion (GMS): Cambodia, The People’s Republic of China (PRC) (Yunnan and Guangxi Provinces), The Lao People’s Democratic Republic (Lao PDR) Myanmar, Thailand and Vietnam. The mission of the MTCO is to help GMS National Tourism Organizations develop and promote the Mekong as a single travel destination, offering a diversity of good quality and high-yielding sub-regional products that help to distribute the benefits of tourism more widely; add to the tourism development efforts of each GMS destination; contribute to poverty reduction, gender equality and empowerment of women; and minimize any adverse impacts of tourism through the development of a sustainable industry. For more information, please visit www.MekongTourism.org.